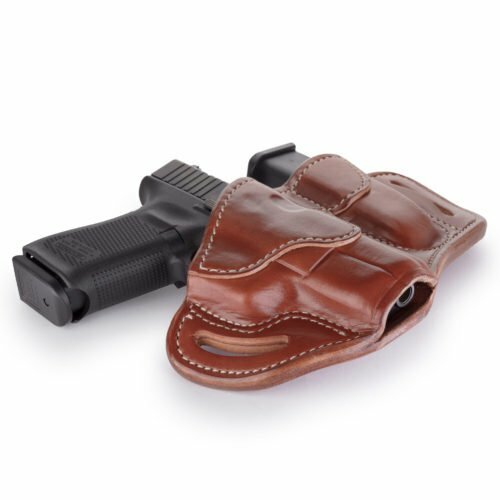 This premium leather OWB belt holster is ready for action with an obstruction-free open top that allows a quick draw. Made with stiff, sturdy, 100% Certified American Heavy Native Steerhide put through a wet molding process and double-stitched by fourth-generation leather artisans for a high-quality, snug, and reliable fit that carries comfortably all day. 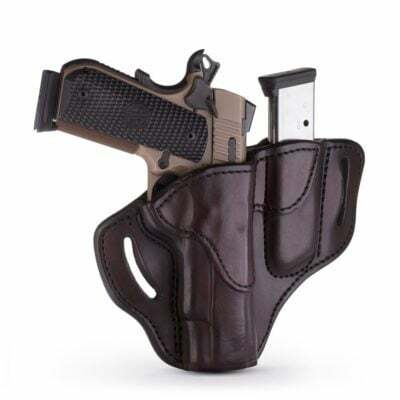 The 1791 Gunleather Open Top Holster with Mag Pouch comes with a multi-fit design that accommodates a wide range of firearms from Berettas, Brownings, Colts, and Glocks, to Rugers, Sig Sauers, Smith & Wessons, and Springfields. Magazine pouches come in various different configurations. There are single stacks and double stacks, depending on how much ammo you feel comfortable carrying. They come in leather, cordura nylon, Kydex plastic, or polymer. They can be bulky with easy access or discreet for concealed carry. Often, mag pouches come in a universal design with adjustable top flaps to fit longer or shorter magazines. The 1791 Gunleather mag pouch is designed for OWB carry on a sturdy gun belt. While it’s not ideal for a concealed carry situation, it’s a trusty method of fastening ammunition to your person. Compared to molded mag carriers, a leather pouch will fit more types of magazines for better versatility. Compared to Kydex or polymer, a leather pouch is more comfortable, as it molds to the contours of your body. Narrow Profile – Compared to similar holsters in this category, ours offers a relatively slim and minimal print. Security – Pancake holsters snugly hold guns using natural pressure between the two pieces of stitched leather. Quick Draw – Open top holsters lack thumb breaks or other security features that get in the way of your draw. Easy Reholstering – The 4 o’clock carry position with forward cant offers a natural feel for re-holstering. Stylish Design – Nothing beats the look, smell, and feel of premium hand-crafted leather. Fit –Pistols and revolvers from a wide variety of brands fit like a glove after the proper break-in process. Comfort – Wide-spaced loops allow a closer ride, while leather warms and conforms to your body. Value – We give you twice as much for the money in terms of quality materials and craftsmanship. Durability – The wet-molding process ensures the treated steerhide leather retains its shape over the years. Fair Warranty – We offer a Lifetime Warranty on our craftsmanship and stand behind our products 100%. Customer Service – We’re a small company offering friendly, personalized service and satisfaction guaranteed. 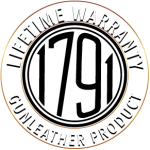 Contact 1791 Gunleather with any questions or place your order today.